I always wanted to build a large scale scratch built helicopter. The CH-54 Skycrane always intrigued me because one; its size, and two; you can see all the workings on the outside of the fuselage. Little did I know that just about everything that goes along with a helicopter is on the outside of this one! About the only thing that you can’t see on this bird is the fuel cells and cabin heater. They are concealed in the fuselage. And all that exterior chopper stuff needed to be scratch built in detail from sheet styrene, solid plastic blocks, and plastic tubing. The basic construction is styrene plastic with a little telephone and doorbell wire. The fuselage is 1/8” plastic bulkheads, stringers, and thin styrene skin. The turbine engines and everything else that is round is plastic tubing. I turned down a chunk of plastic to make the turbine engine inlet bells, main rotor gearbox, and tail rotor gearboxes. The wheels are rubber RC airplane wheels. I had to make my own main rotor blades. They have a 1/8” steel piano wire spar with 0.020” plastic skin. The models main rotor diameter is 48”. The same construction was used for the tail rotor blades using 0.010” plastic skin. The main lifting hook under the main gearbox has a detailed cable reel and hydraulic motor. The four load leveling hook assemblies have the reels, hydraulic cylinders, hydraulic lines, accumulator spheres, and electrical wiring. 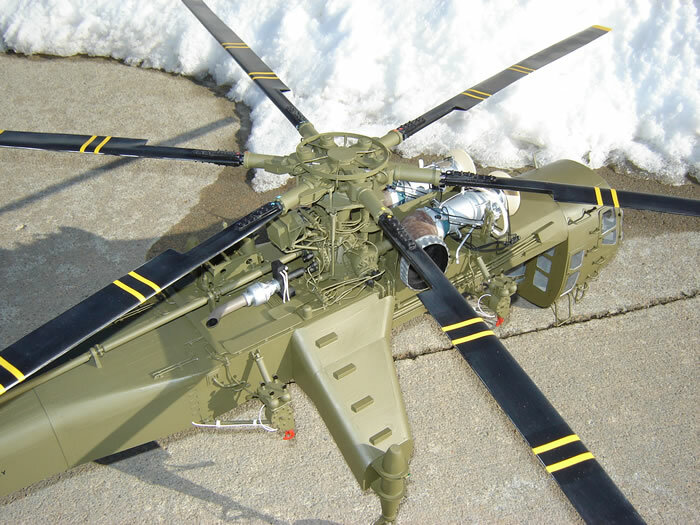 The tail rotor system has control cabling, bell cranks, push pull tubes, hydraulic lines, and electrical circuitry, and tail skid, all detailed out. The main gearbox has all the cyclic and collective control cylinders, push pull tubes, bell cranks, hydraulic lines, transmission lubricating lines, belt driven cooler, pumps, auxiliary power plant, generators, and disc brake system. The rotor head? Well, there are over 300 plastic pieces just in that assembly. All had to be fabricated. The one big question that I had at the beginning of this project was why do the turbine engines appear in photos to be set at different elevations? My answer was supplied by the “CH-54 Skycrane Association”. Thanks guys. The main rotor gearbox was offset 3 degrees to the left and 5 degrees forward to compensate for the massive rotational forces of the main rotor. Therefore the starboard engine drive centerline is set approx. 2.25” higher that the port engine (about 1/8” on the model). The model judges will probably never know that, and I will get points deducted for not having my turbine engine centerlines line up and my main gearbox not straight with the world. Oh well, I know its right! The project was quite an undertaking. Eight months plus thus far. I purchased a copy of the CH-54 maintenance manual which was a huge help. The research has been fun. 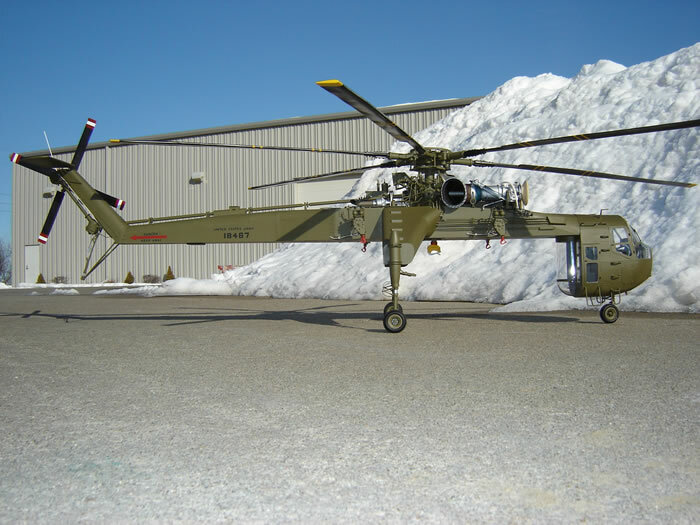 I got to correspond with some great guys at the “Skycrane Association” who actually got to mess with the beast in her hay day. This CH-54B, 69-18467, was manufactured in September 1969 and assigned to the US Army (station unknown). She had a stint with NASA at Langley Field from 3/18/72 to 1/15/74. Among other duties there, she was used to drop models of the space shuttle for glide tests. As civilian registry N718HT, I believe she still flies on forest fire and heavy lifting duties with ”Helicopter Transport Services”. 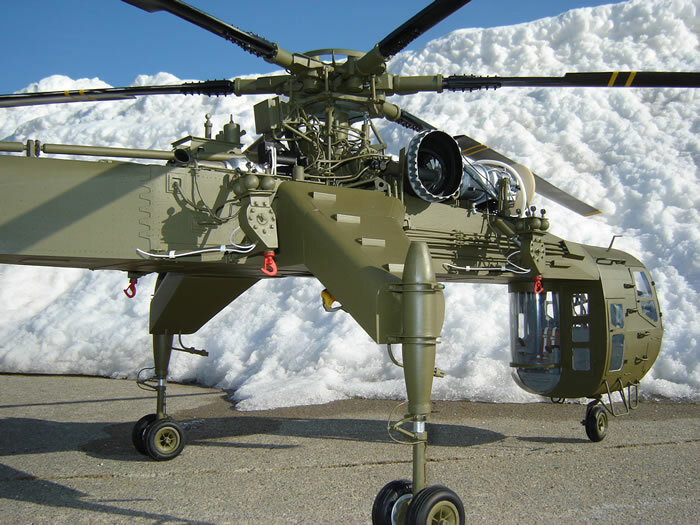 These heavy lift helicopters are still being manufactured in civilian form under license from Sikorsky. She may not be the prettiest chopper in the sky, but I have to admit, to me, she’s a beauty and a beast. And should be flying, lifting, and dousing fires for a long time to come. Now I just need to find a place to display her.